Read by the new Program and Editorial Associate of the Coolidge Foundation, Rushad Thomas, here is the first installment of the finest Presidential memoirs ever written. It is aptly suited for reading, written as it was for child and adult alike. Listen carefully, take time to reflect on the observations and insights offered and be ready to learn from one of the wisest and most underestimated of our Presidents. 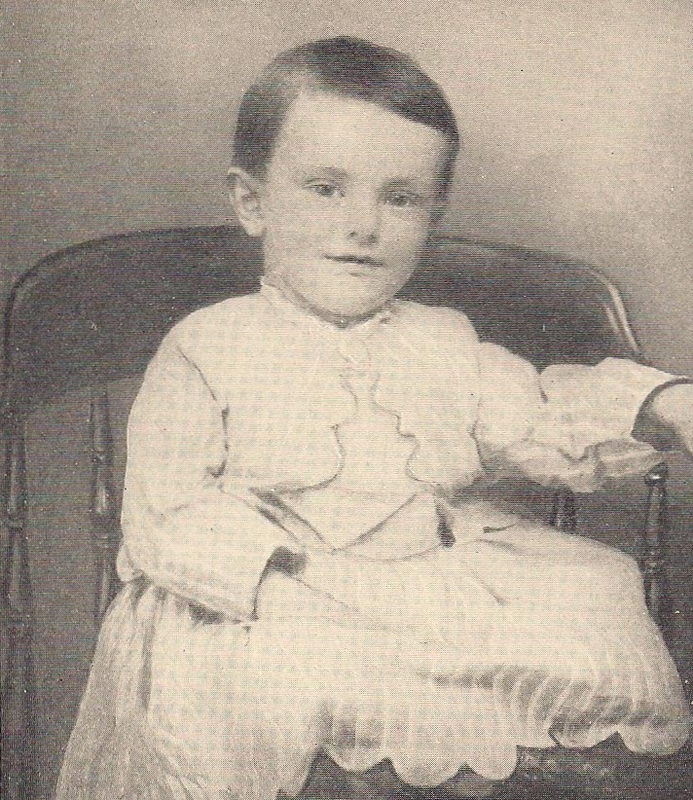 Calvin at age 3, 1875-76. This was the year his grandfather carried him the to the Vermont State House in Montpelier. When little Calvin reached for the gavel, it was time to leave. Little could anyone suspect that the authority of a presiding officer would loom large in his future (The Autobiography p.18). The Twenties were a decade for Pan-American, or otherwise international, conferences. Coolidge took part in no less than eight during his service in Washington. The issues of international commerce, Pan-American relations, the roll back of “dollar diplomacy” and question of tariff policy revision seemed to attract him to a degree not unlike his commitment to government economy. No one can credibly argue that the Coolidge years were isolationist in outlook or activity. He took every opportunity to personally address those gatherings of private individuals who met to discuss a host of topics from standardization, sanitation, journalism, radio, highways, trade, aviation and many more concerns. As Vice President, Coolidge spoke before the Pan-American Conference of Women sponsored by the League of Women Voters in April 1922. 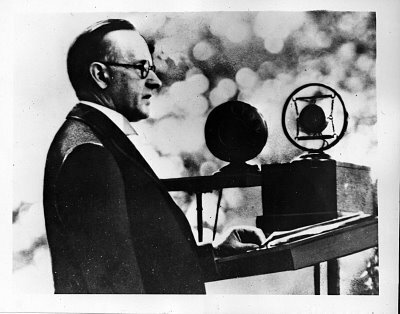 As President he would address the First Pan American Congress of Journalists (April 8, 1926), the Third Pan American Commercial Conference (May 3, 1927), the First International Congress of Soil Science (June 13, 1927), the opening day of the International Radiotelegraph Conference (October 4, 1927), the Sixth Pan-American Conference held in Havana, Cuba (January 16, 1928), the Pan-American Conference on Arbitration and Conciliation (December 10, 1928) and the International Civil Aeronautics Conference (December 12, 1928). When it concerned America’s connection to the sovereign nations to our south, Coolidge was there at every turn. The Fordney-McCumber Tariff signed by President Harding in 1922, sought to return a higher ad valorem rate to the tariff system, where American-made goods were protected for their value to the markets beyond merely their quantity, size, weight or other factors. The vast majority of goods on the market, no less than sixty percent, were completely free of duties. The Tariff protected American manufacturing while keeping rates low for agricultural products and raw goods. An average 14% increase in rates protected manufacturers from inferior-quality goods flooding the markets and thereby harming both the producer, who has to raise prices to meet higher costs against a cheaper, higher quantity of products, and the consumer, who is left spending more money in the end to replace inferior goods with ones that last. The protective rates, working together with both a large decrease in taxes and reduction in Federal spending, fueled the recovery that brought America out of the 1921 depression and continued (thanks to the Coolidge insistence on economy and tax cuts of 1924, 1926 and 1928) to encourage the spread of prosperity throughout all economic tiers through the rest of the decade. Rather than remaining on course, however, the next administration dismantled the delicate balance of tariff policy up for debate at the worst time. It was the discussion to raise rates even higher in 1929, leading to the passage of a new bill, the Smoot-Hawley Tariff, that unleashed an average 20% increase on dutiable imports, a 60% tax increase on over 3,000 imported products and resulted in a destructive series of retaliatory tariff increases by our trading partners around the world. Despite the firm opposition of more than 1,000 economists to the looming increases, President Hoover signed the bill into law in June 1930. While initial figures seem to indicate it was working at first, trade had collapsed and depression only deepened as a result by the spring of 1932. 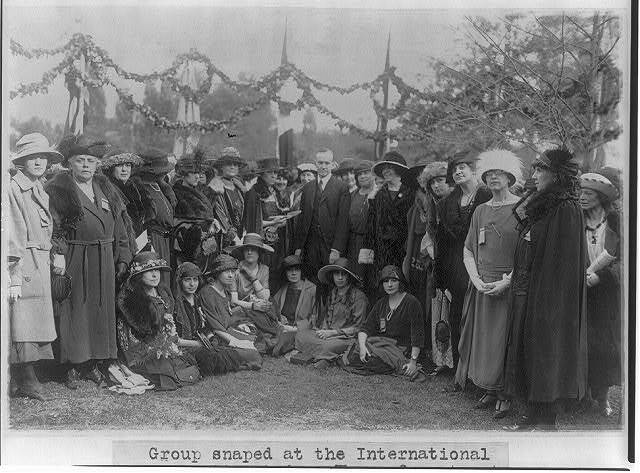 The Coolidges at the Pan American Conference of Women, Baltimore, April 28, 1922. Delegates from 21 nations took part in the gathering. However, all this was in the future. 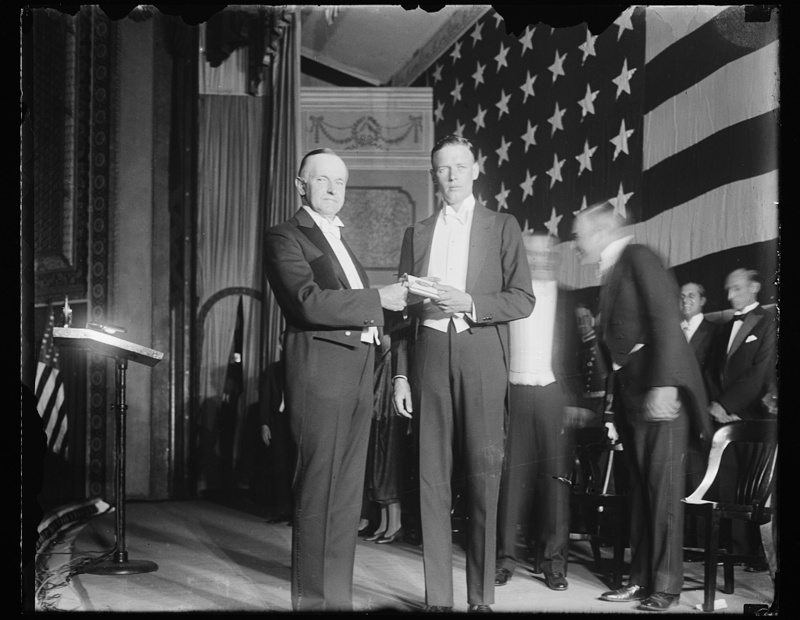 As Coolidge took the podium to address the entrepreneurs and business men and women of North, Central and South America, imports in raw materials stood on mutually advantageous terms. As Coolidge will point out, this gathering was not a meeting of government bureaucrats and political operatives, it was a voluntary conference between private individuals exchanging ideas, seeking to better understand the needs, problems and market solutions of free peoples, sharing in the “civilizing influence of commerce.” It was not a forum of coercion presenting terms that benefited one at the expense of others with the aid of American money, military might or political deals. It was part of a the grander movement that “rests on the principle of mutual helpfulness,” which is free market capitalism as it naturally exists. Markets, free of state control, are not driven by Bentham’s mechanistic view of people as but utilitarian cogs in a system but rather fellow collaborators, willingly helping supply and be supplied with what each individual needs. 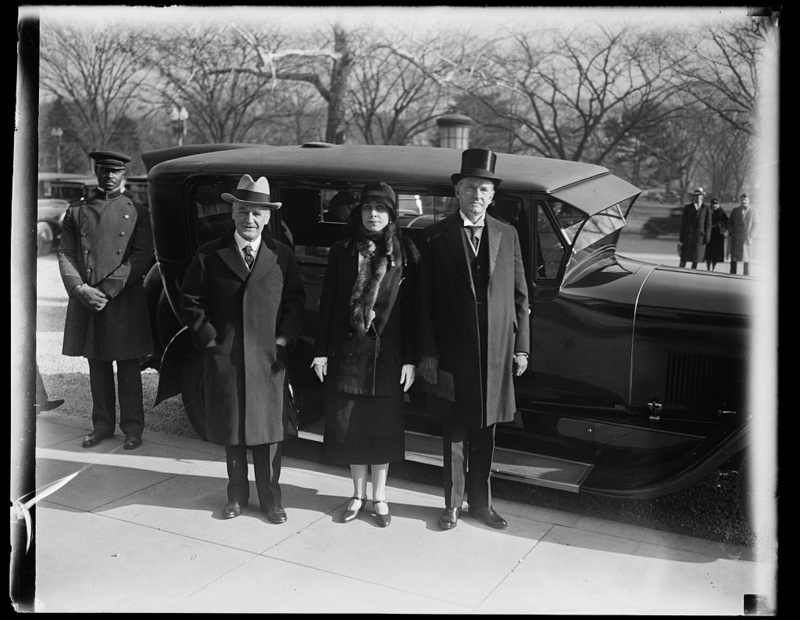 The Coolidges in worship services en route to Havana to attend the Sixth Pan American Conference, January 1928. 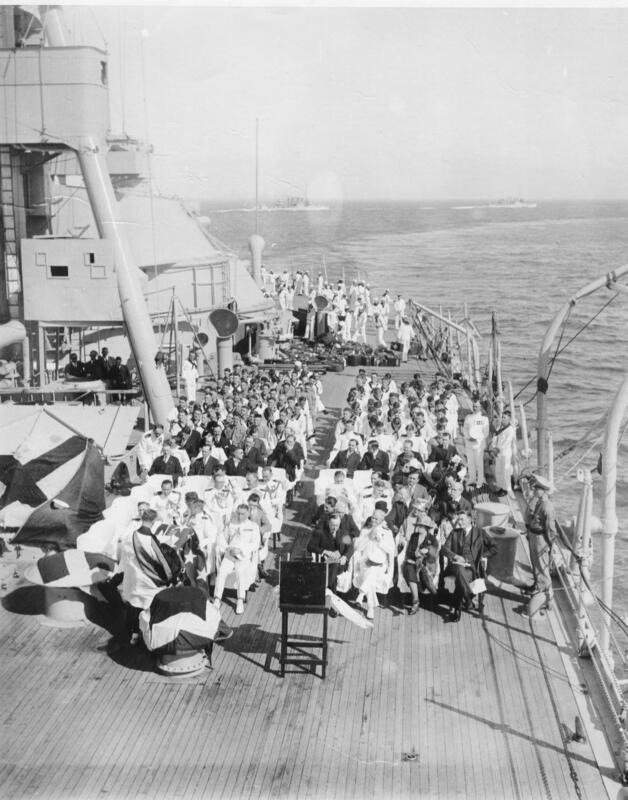 They can be seen seated on the front row to the right on the deck of the USS Texas. 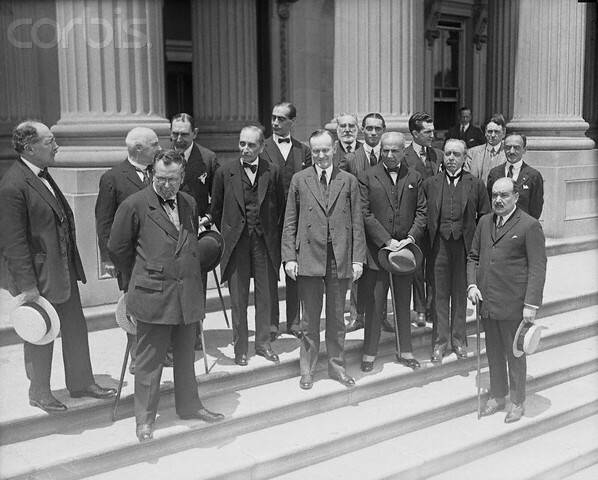 Vice President Coolidge entertains South American delegates to the Chile-Peru conferences then in session at Washington, June 1, 1922. 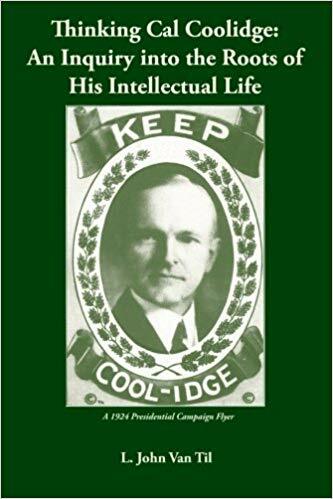 Coolidge did not merely praise the broad outlines of growth and commercial collaboration between the Americas, he lauded the specific directions it was taking in the development of transportation, improving the speed the travel by ship, rail, road and air. Coolidge complimented the great network of exchange not only for its material improvement but especially for its conveyance of ideas, its sharing of information, education and communication, embodied in the cable and radio, the Pan American postal agreement, the opening of roads and the clearing of new commercial horizons that resulted. In short, this meant a “more abundant life for all concerned,” not only materially but spiritually. Calvin Coolidge and Charles Lindbergh, November 1927. Lindbergh was virtually conscripted as an ambassador of good will to Latin America, on an even grander scale than the pilots of the Pan-American Goodwill flight of 1926. The diplomatic campaign, on the “wings” of Lindbergh’s remarkable solo crossing of the Atlantic that summer, did much to advance Latin American relations. Lindbergh would also meet his future wife, Anne Morrow, as a result of his unwitting venture into diplomacy by airplane. Tomorrow, April 15, will mark the ninetieth anniversary of the dedication by President Calvin Coolidge of Arizona’s distinctive state stone into the internal walls of the Washington Monument in 1924. Despite being the last of the 48 to join what Coolidge called the “family” of states, the President knew Arizona would not be the last. In his vision of the future, Arizona, like all of America’s states, carried boundless potential and would reach into vast horizons of great achievement. 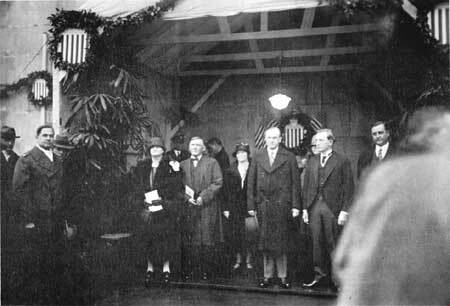 Coolidge identified the significance of this dedication not merely as another occasion to deliver a speech or appeal to mundane platitudes but as an opportunity to consider the importance of each state in our political system, celebrating the principle of local self-governance and the strength each state contributes to the soundness of the whole structure. Coolidge reminds us that an all-encompassing, all-consuming National Government is not an indicator of health and well-being, but rather stems from the failure of that most crucial pillar of local governance. If the people, through their States, abdicate the responsibility to manage their own affairs and make their own decisions, they become suppliant supplicants to Washington, and hasten the collapse of the entire structure. Composed of three petrified logs from the Chalcedony Forest in Holbrook, Arizona, the 2 x 4-foot stone rests at the 320-foot level of the interior wall in the Washington Monument. As Coolidge stood beside Arizona’s striking contribution to the Monument honoring Washington, he understood that “two policies must always be supported. First, local self-government had to continue persisting not simply as a slogan or motto but “in harmony with the needs of each State. This means that in general the States should not surrender, but retain their sovereignty, and keep control of their own government.” The one-size-fits-all “democracy” enforced from a given Federal agency, office or bureau destroys this powerful role each State possesses. If the States lose control of their own sphere of obligations, it only enables the National Government to assert itself with even more inept and reckless results. Still, Coolidge understood that our system did not succeed with a rejection of all government for libertarianism. As he continues, what he would outline next was as equally indispensable for the future of America’s States as the first policy. Second, local sentiments must be a reflection of a “nation-wide public opinion. Each State must shape its course to conform to the generally accepted sanctions of society and to the needs of the Nation. It must protect the health and provide for the education of its own citizens. The policy is already well recognized in the association of the States for the promotion and adoption of uniform laws.” If the States deviated too far from the moral aims and cultural norms of the country as a whole, it would lead to the disregard and impotence of law everywhere. Even more dangerous, it would furnish another excuse for Washington to assume control in order to bring “security” to the situation: asserting jurisdiction over property it did not lawfully possess, over rights no more permitted to grant than to take away, and over details it could not competently understand. 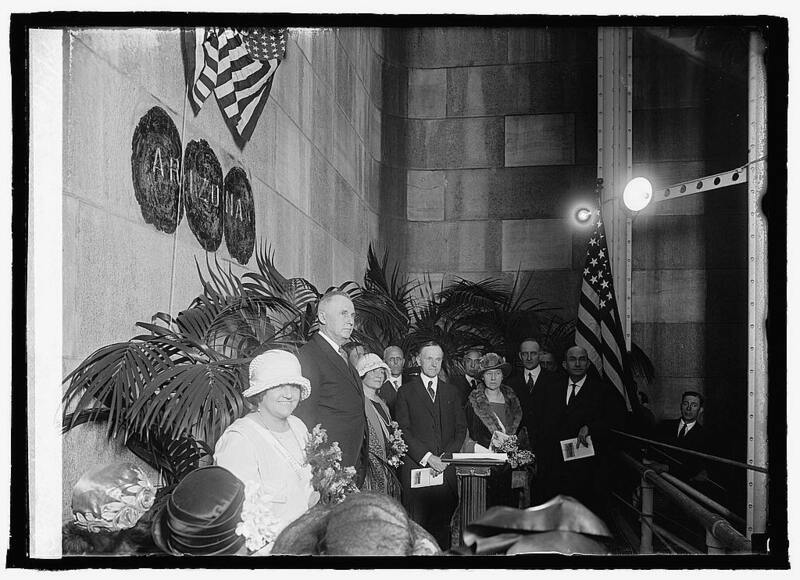 While there would three other states (North Dakota, 1926; New Mexico, 1927; and Idaho, 1928) to join the “family” of State stones during the 1920s, President Coolidge would return only once more to dedicate the 47th state, New Mexico’s contribution, on December 2, 1927. Here is a small snapshot of that occasion. We will do well to reflect on this ninetieth anniversary of a great dedication to Arizona and the Monument to our first President. But that is not all. Tomorrow also affords us the occasion to reflect on our responsibilities, the continuous duty we bear to zealously preserve self-government, vigilant States and a limited Washington.